Enjoy a gig with a troop of monkey musicians in Banana Rock. Created by Play ’N Go, it’s a volatile 5 reel, 10 payline slot game that comes with re-spins with wandering wilds and free spins with multipliers. You’ll also get an Encore Spin where you could boost your win with a multiplier of up to 25x. Play on all devices from between 10p and £100 per spin. Neon dominates the design in Banana Rock. Set against a backdrop of jungle foliage and throbbing speakers, you’ll see lower value A to J symbols plus 5 members of the band. In order of value are the percussionist, keyboard player, double bassist and drummer. The top standard symbol is the guitarist who’ll get you 5, 10 or 40 times your stake if you land 3, 4 or 5 on a payline. There’s also 2 wilds, the gold disc and the lead singer, that substitute for all other symbols apart from the scatter. These also pay 40 times your bet if you land 5 across a payline. Banana Rock comes with 3 bonus features. Rock ‘N’ Rollin’ Re-Spins feature - these are triggered if you land 2 of the lead singer wild on the same spin. As the reels re-spin, the right most wild moves across the reels towards the left most wild to create a trail of wilds. The wild can move vertically or horizontally too. 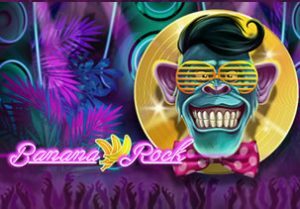 Free Spins feature - land the Banana Rock logo scatter on reels 1 and 5 on the same spin to trigger this round. On offer are 10 free spins. Every scatter that lands adds 1 extra free spin to your total. You can power up your wins here by landing a fully stacked member of the band. Each band member can provide a multiplier boost of up to 5x which comes into play in the Encore Spin feature which follows the free spins. The collected band member multipliers are applied to any wins you hit on the final Encore Spin. A full allocation provides a 25x boost. With the monkey musicians running riot, there’s an anarchic feel to Banana Rock. That’s matched by the volatility here which is high. You can win up to 2,500 times your stake on each Encore Spin with the 25x multiplier. The design here is pretty good and the re-spins with wandering wilds and the free spins with encore spin can deliver some pretty lively action. The theme is supremely silly but for some volatile monkey magic you won’t go too far wrong here. I also suggest you try Shamrockers Eire to Rock which is by IGT and features popstar leprechauns.